Pr e s by te r i a n s To d ay | OCTOBER/NOVEMBER 2017 9 Swipe the page New ways of experiencing faith S everal years ago, we faced a mystery in our home. When my older children were 3 and 4 years old, all of our children's books were getting ruined. The pages were wrinkled, folded and ripping. The books could not fit on the shelves because the damaged pages made each book take up twice as much shelf space as it should have. We were forced to throw the kids' favorite books in the garbage because they were unreadable. I saw it as a crisis of responsibility. How could our children be so careless with their possessions? Then one day I stopped and watched my son flip through a book, and I instantly understood the problem. My kids were swiping book pages. They were putting their index finger on the page to the right and sliding the page across as if it were a smartphone or tablet computer. This was damaging the pages because they were being bent and pulled in ways they were never meant to be used. When I got an iPhone, I figured out swiping quickly because I realized that it was like turning pages. My children, on the other hand, are so oriented toward the technology that they saw a book and thought, "This is like swiping a screen." Hence, our book pages were being ruined. In the years since this encounter, I have seen the difference over and over again. I have had to explain to my children what a landline is, what phone booths were and the purpose of a phone book. I am only 34 years old, but I can already see how different the world is that they are growing up in. I wonder sometimes if I will have to explain to my grandchildren what a pencil was, or a gas station, or a mall. As fast as the world is changing, the church seems to remain the same. Many of our Sunday services seem like a time loop from the 1960s. 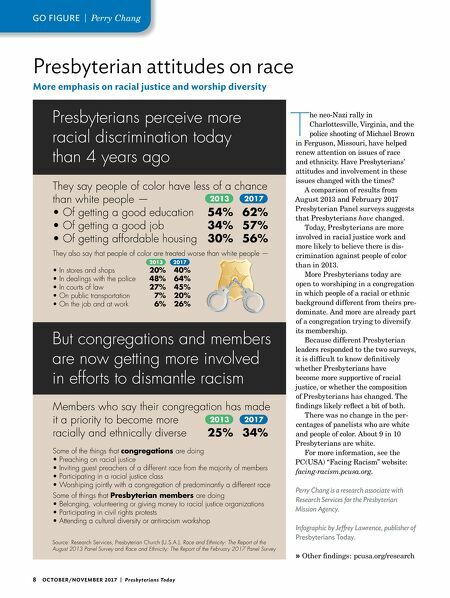 Forward-thinking Presbyterian churches seem to be from the 1990s. If the 1960s ever return, many of our churches are primed for growth. But, if anything, society is racing faster and faster away from the 1960s. To my kids, the '60s may as well be the Dark Ages. There is an understandable reason why the church has resisted change. Many people in our churches have felt the sting of change as companies they worked for their whole lives closed, their kids moved away from home and their grandkids will have nothing to do with the church they love. The last bastion of hope and stability was that as much as the world changed, at least the church stayed the same. This is sometimes why people flip out when you change the carpet color or paint the sanctuary. They are not simply reacting to the change. They are reacting to all the other changes in their lives that the sanctuary helped them deal with. The church is supposed to be a place of hope. The good news of Jesus is timeless. But the hope is not in the struc- tures and traditions. Those are meant to be timely. They were created to help people experience God in their lives. The church should be ahead of culture — shaping culture. But the opposite happens too often: The faster the world changes, the harder we hold on to the past and the farther behind we end up. As I pastor, I often think of my kids and grandkids. Am I helping to lead a church that will speak to them? What will advancing technology and sweeping changes in perspectives mean for the church of tomorrow? I am not suggesting that we abandon traditions or structures, but we cannot continue to do the same thing for the sake of our familiarity or comfort. We must breathe new life into old traditions. We must rediscover why we do what we do, from passing the peace, to preach- ing the message, to sharing Communion. We must also expect that new traditions and expres- sions will arise. The challenge of pastoral leadership in traditional churches today is to gently and tenderly help our churches embrace the future and not hide from it in the past. We must swipe the page. Jordan Rimmer is the pastor of Westminster United Presbyterian Church in New Brighton, Pennsylvania. You can find him at jordanrimmer.com. 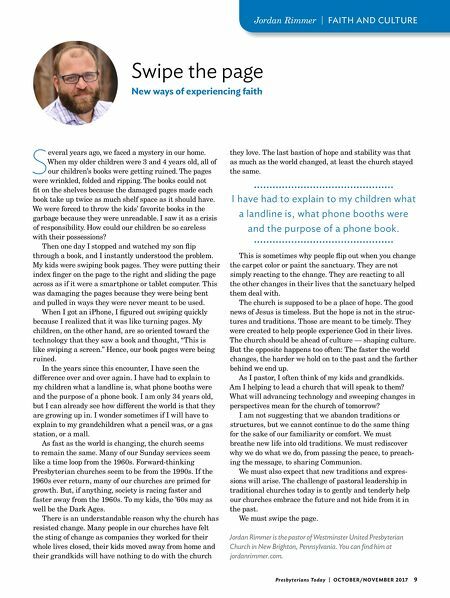 Jordan Rimmer | FAITH AND CULTURE I have had to explain to my children what a landline is, what phone booths were and the purpose of a phone book.